Here is some information on the surname Staple that I have found over the years. The information on the Belgic Tribe Menapii having it’s seat of government at the French town of Cassel which governed the village of Staple, Nord, France, located on an old Roman Road and the location of Staple, Kent, England about the same distance inland from the channel as Staple, France and also located by an old Roman Road, with the oldest known inhabitant with the original surname name of Omer (as in St. Omer, France) makes for an interesting hypothetical story. c. 530 BC; the name STAPHYLUS is referred to in Greek mythology as the son of Ariane and Dionysus, the God of Wine. STAPOL: Old English for post. Barnstaple history indicates that its name derives from Old English in the 9th or 10th century “Bearda’s STAPOL” meaning ‘Trading Post of a man called Bearda’. **STAPULA: Latin for a “marketplace”. In northern France, ~10km (~6 miles) east of St. Omer, is the village of STAPLE, NORD, FRANCE, its documented history shows that its name derived from the Latin word Stapulas, recorded in the Map Archives of Saint Bertain in 1026. It is at the crossroads of an old Roman road and was a marketplace with warehouses. The land Title of the Lordship of Staple, was part of the Court of Cassel. In 1328 Robert de STAPLE was Lord Rewart of Berques who received his title from Philip Duke of Burgundy. There street signs still carry the Coat-of-Arms of Robert de Staple (Found on my website Home page). From Wikipedia, the free encyclopedia; Godfrey of Saint-Omer (also known as Gaufred, Godefroi, or Godfrey de St Omer, Saint Omer) was a French Knight and one of the founding members of the Knights Templar in 1119. He is said to have come from the family of the Lords of Saint-Omer (in today’s northern France), possibly the son of William I, Lord of Saint Omer and Melisende de Piquigny. William and Melisende were known to have a son, Hugh, and both William and Hugh participated in the First Crusade as vassals of Robert II of Flanders. Hugh of Saint-Omer was also mentioned as one of the best knights in the Kingdom of Jerusalem. **STAPLE, KENT, ENGLAND: Middle English for a marketplace as appointed by English and French Monarchy designating a place where principal goods were stored and traded between countries. Eventually the name STAPLE became to mean a place where principal commodities, such as wool, are bought and sold and was also used to describe the various commodities as staples. It is said that in 1234, Henry the III founded the Hospital of Ospringe located in the parish of Headcom and land in Twithan, STAPLE, Adisham, Wingham and Hammewolde’ in Kent. Among the Masters or Wardens of Ospringe, 1234 – 1515, are Alexander de STAPLE, appointed 1295, and Nicholas de STAPLE, appointed 1310, removed 1314. The village of STAPLE is located on an old Roman Road in Kent ~12 km (~7 miles) east of Canterbury. According to its history one of its earliest families carried the surname of Omer which changed to Homer. The city of St. Omer in northern France is about 6 miles from the town of Staple, see Stapula above. * Here is my favorite old English Will with reference to the son’s of Water Stable whose sons reside at Staple. Will of Water Stable of Orpington, Kent, England, 1503, taken (in part) from a transcribed copy. Water Stable (or Staple) of Orpington, Kent was laid to rest at his requests in the churchyard of Orpington. His will was dated “xxiii day of the month of August in the year of O’ Lord God M+ V and three. Note – this will is especially interesting because it shows how surnames can be changed at a very early genealogical date within a family branch leaving descendants to figure out who is who. Hurray for Y-SNP DNA! STAPLES: A variant of STAPLE; in England some families referred to themselves in the English plural form, while on the continent the surname remained in the singular form as STAPLE or STAPEL. STAPEL: Middle Low German for a ‘Column’, ‘Signpost’, ‘Warehouse’ or ‘Market’. A Rhine-skipper called Godart STAPELL from Myllingen (Millingen) Netherlands during the period Oct 5, 1466 is mentioned on page 150 of the book “Bijdragen Van Het Instituut Voor Middleleuwse Geschiedenis Der Rijks-Universiteit Te Utrecht, O, Oppermann en D. Th. Enklaar, Chapter XXVI. STAPLETON: A variant of STAPOL or STAPLE, of English origin with a good number of families migrating to Ireland, derived from the Old English Stapol ‘Post’ or Staple ‘marketplace’ plus tun ‘enclosure or settlement’ [Stapoltun/Stapletun]. In Ireland some branches adopted a Gaelic patronymic, viz., Mac an Gaule which in due time was anglicized Gall, Gale and Gaule. Some leading STAPLETON’S backed the Jacobite cause in Ireland and were forced into exile after its defeat, settling at Nantes, France, where an Irish Colony was established. The French department archives contain records of naturalizations of Irish-born Stapleton’s during the first half of the eighteenth century. The Belgae were a group of tribes living in northern Gaul, between the English channel and the west bank of the Rhine, from at least the 3rd century BC. They were later found also in Britain, and possibly even Ireland. The Belgae gave their name to the Roman province of Gallia Belgica, and very much later, to the modern country of Belgium. The Menapii were a Belgic tribe of northern Gaul in pre-Roman and Roman times. Their territory according to Strabo, Caesar and Ptolemy stretched from the mouth of the Rhine in the north, and southwards along the west of the Schelde. Their civitas under the Roman Empire was Cassel (northern France), near Thérouanne. (The positions of such Roman tribal capitals did not always correspond to pre-Roman political geography.) In later geographical terms their territory corresponds roughly to the modern coast of Flanders, extended into neighboring France and possibly the Netherlands. The town of Cassel is situated at the top of Mont Cassel, a prominent hill located in the local Woodland region about 30 kilometres (19 mi) from the sea. The hill rises to a height of 176 metres (577 ft) above sea level. The hill of Cassel was occupied during the late Iron Age by the Menapii, a Belgic tribe, who made it the capital of a large territory extending from modern Calais to as far as the Rhine. The hilltop was probably used as a hill fort. The Menapii fought against Julius Caesar but were forced to submit to Rome in 53 BC. They rebelled along with their neighbors’, the Morini, in 30 or 29 BC. 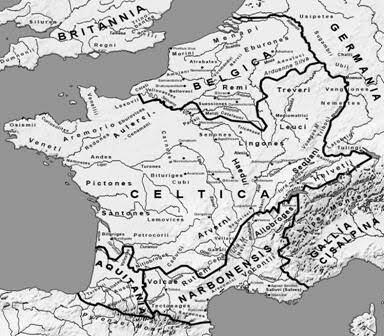 The Roman governor of Gaul, Carrinas, successfully quelled the rebellion and the territory of the Menapii was subsequently absorbed into the Roman province of Gallia Belgica. Cassel was redeveloped as Castellum Menapiorum, the urban centre or civitas of the Menapii; the modern town takes its name from the Roman settlement.